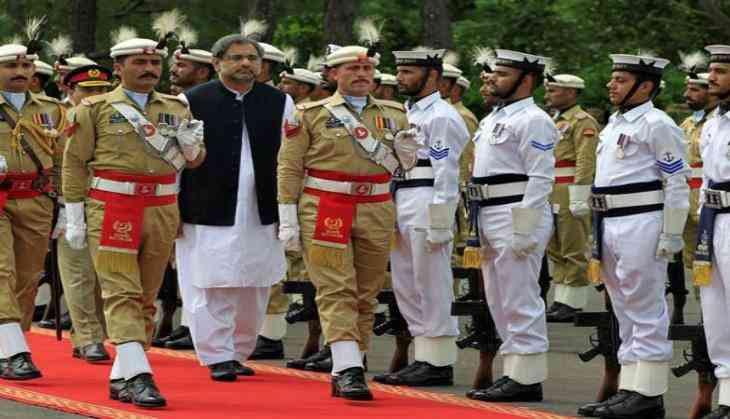 Pakistan Prime Minister Shahid Khaqan Abbasi on 14 August urged the international community to play its due role in resolving the Kashmir issue with India. "It is incumbent upon the international community to play its role in the resolution of the regional conflicts, particularly the Kashmir dispute in conformity with the UN Resolutions on the subject with a view to ensuring durable peace in the region," Abbasi said in his address to the nation on the occasion of Pakistan's 70th Independence Day. He said Pakistan desires to have positive and constructive relations with all countries of the world, especially with its neighbours on the basis of sovereign equality. Praising the freedom fighters of the country, Abbasi said, "We are greatly indebted to our ancestors for their sacrifices and we can repay that debt only by making Pakistan a free and independent country." He noted that the recent transition of power through a democratic process was quintessential of the accelerated strengthening of democratic values in the country. Abbasi stressed on strengthening and reinforcing the state institutions so that they can play their prescribed role within the limits of law and the constitution. Asserting that a strong economy can ensure a strong defence, Abbasi said a moderate society guarantees stability of the state, where people enjoy all their fundamental rights and national resources are equitably and judicious distributed. Pakistan was created out of a partitioned Indian subcontinent on August 14, 1947. It came into existence as a result of the Pakistan Movement which aimed for the creation of a separate Muslim state by partition of the north-western and north-eastern regions of undivided India. The movement was led by the All-India Muslim League under the leadership of Muhammad Ali Jinnah. This was facilitated by the British parliament passing the Indian Independence Act 1947, thereby giving recognition to Pakistan.